Since 2008 Alter Terra has facilitated cross-border research opportunities for students attending the University of California San Diego. Our cross-border initiative serves as a mechanism to promote engaged scholarship in the San Diego-Tijuana Metropolitan Region. 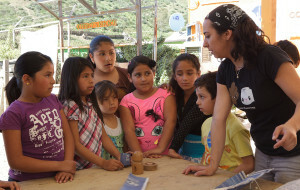 Alter Terra’s Community Center and Scientific Research Field Station are located in Colonia San Bernardo, a marginalized community ensconced within Tijuana’s Los Laureles Canyon. We are proud supporters of the Superfund Research Center and the Global Health Initiative. The UCSD Superfund Research Center (SRC) includes a Community Engagement Core (CEC) directed by Professor Keith Pezzoli from the UCSD Urban Planning Studies Program and co-directed by Professor Wael Al-Delaimy from the UCSD School of Medicine Global Health Division. After months of discussions and engagement of community members in the decision making process, the target of the Core became Tijuana’s Los Laureles Canyon. The canyon is a 4.6 square mile micro-basin of the Tijuana River Watershed which drains north across the border into the protected acreage of San Diego County’s Tijuana River National Estuarine Research Reserve, (designated by the Ramsar Convention as a “Wetland of International Importance” in 2005). UCSD researchers and key community organization members attended a brainstorming session at UCSD to prioritize significant environmental toxicant areas in the San Diego-Tijuana Border Region. During this initial meeting, Alter Terra, a Tijuana based NGO, was identified as a collaborative community partner based on their research experience in the border region. SRC would design the research study and Alter Terra would execute the field research for the Los Laureles Project. Many NGO’s, such as Alter Terra, participate in multiple types of research including environmental, epidemiological, social science, health services, translational and policy research. Alter Terra has been involved in conservation projects and action research in the San Diego-Tijuana Border Region for close to two decades, most recently, conducting toxicant research in the canyon by placing tracking devices at open dump sites and monitoring their signals as they flow across the international border into San Diego. The UCSD-Alter Terra partnership dates back to 2009 when Professors Pezzoli and Romo worked together on the Superfund sponsored video project Los Laureles Canyon: Research in Action. And last summer, Dr. Pezzoli participated in a six month series of Alter Terra sponsored Leadership Training and Environmental Public Health Workshops in the Los Laureles Canyon focused on educating canyon residents on how to access government assistance to bring improved health services and public infrastructure to their sub-standard neighborhoods. Alter Terra and CEC research teams worked collaboratively with UCSD’s Center for U.S.-Mexican Studies and the Autonomous University of Baja California School of Medicine and Psychology to build the framework for a toxicant study, draft a public health survey and design community outreach workshops. In October of 2012 SRC and Alter Terra developed a scope of work for field research, and in November the partners began work on the Los Laureles Study. A progress report on this work will published in a separate document later this month. The multi-disciplinary nature of this collaborative relationship is unique in advancing the interest of the involved community and all partners of the collaborative process. 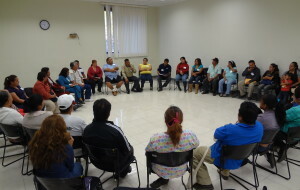 The CEC is fulfilling its obligations to funders to reach out to the community, Alter Terra is fulfilling its obligation to the community in Los Laureles by engaging in important research that benefits community residents, the Center for US-Mexican Studies is fulfilling part of its mandate to include cross border research, and the Autonomous University of Baja California School of Medicine and Psychology (UABC) students and staff are receiving research training and fulfilling their academic obligations. This type of progressive partnership allows for constant interaction throughout the research process from research design to data collection and interpretation of results, and eventually, to dissemination and community feedback. The collaboration, between the University, the NGO and the vulnerable communities they serve, arose out of a shared interest in the public safety and environmental health of the San Diego-Tijuana Border Region and has served to strengthen the longstanding relationships of the organizations involved in the collaborative process. The underlying premise of CEC community-based participatory research creates a win-win situation in which community partners provide access to empirical evidence, field experience and connections to foreign-based communities of interest, while the UCSD Superfund Research Center provides theoretical framing and methodological expertise in scientific research design.